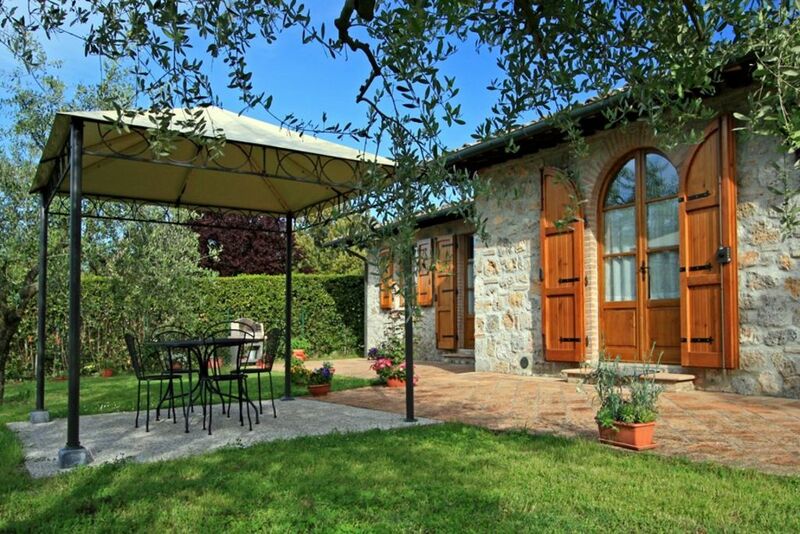 This property is a lovingly renovated farmhouse situated at the edge of the small hamlet of Lucciana, just 4 km from the lager hill town of Casole d’Elsa. Internally the house is attractively furnished with a practical kitchen opening onto the dining room with direct access onto a large furnished terrace,spacious and airy living room with comfortable double sofa bed (ideal to be also used as an extra double bedroom being this separated and accessible both from the dining room and from the two window doors onto the garden), two double bedrooms, 2 bathrooms with shower, laundry room. The villa is surrounded by an extensive olive garden, completely enclosed and provided with an inviting 5 x 7 m. private pool available from May to October, ideal for spending a relaxing holiday both for couples and for families. Details: 4+2 pax / 100 sqms: Ground floor - kitchen, dining room, living room with double sofa bed, 2 double bedrooms (one can be split into two single beds), 2 bathrooms with shower, laundry room. The region is located in the central, western part of the country, north of Rome and south of Genoa. It is bounded by the Apennine Mountains to the North and East, the Apuan Alps on the Northwest and by the Tyrrhenian Sea on the West. From the Etruscan to the Romans to the Renaissance, Tuscany is possibly the greatest repository of art in the world, from extraordinary paintings and sculpture to frescoes and architectural masterpieces. Tuscany: a row of cypress trees breaking the blue sky on a rolling hilltop. Olive groves and grapevines marching tidily down the side of a slope. Little medieval hill towns gazing down upon a country that has been carefully cultivated. The Chianti area, between Florence and Siena, is one of the most beautiful countrysides in Italy and a famous wine production area. Siena is one of the most popular destinations for travellers to Tuscany. Siena is home to the famous horse race, the Palio, held in Siena's unusual central square.